Abrasive blasting and low/high pressure water blasting. EPA Licenced Grit Blasting using a wide range of mediums (including Garnet and Soda). Low Pressure Water Blasting (3,000 to 5,000 PSI). High Pressure Water Blasting (up to 20,000 PSI). 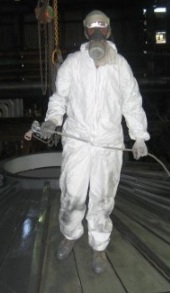 Protective coatings using all approved paint suppliers. Level Two Nace Paint Inspectors. Wet and dry hire of blasting and coating equipment. Compressors, Mega Blaster Units, 20,000 PSI Water Blaster, assorted low pressure gernies. Tilt tray truck available for delivery. Short term or long term rates available. Advanced Aqua Blasting consistently apply quality with safety to each project to ensure client satisfaction is met at all times. Our team are able to work within your project's specification, meeting all QA requirements with our NACE Paint Inspectors. Safety is our top priority. Our WHS Officer and all supervisors are First Aid Trained. Three Mobile Blast units are available, in addition to our Ingham Workshop facility, providing a full range of services.